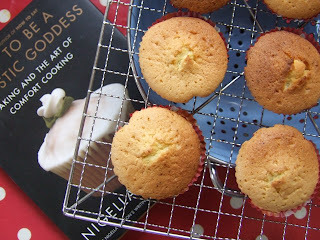 Good old Nigella - she can always be relied upon for simple, sweet cakes and so it was that I turned to her for a bun/fairycake recipe. 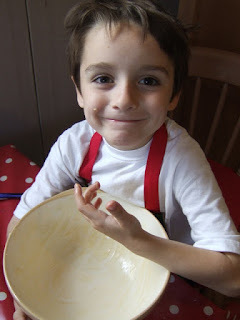 I haven't made these since I was a kid but want to make & decorate them for my new baby's Christening, instead of a cake. (I'm not sure the kids in attendance would appreciate my healthy spelt ones...) So we had a practice run this morning - making a vegan version of Nigella's buns - and oh, yum yum! I'm not sure how Nigella would feel about the veganising of her recipe - she is notoriously disapproving of vegetarians - but these buns are perfectly sweet little mouthfuls. I use Pure's new sunflower spread with Omega 3 & 6 where Nigey uses butter but I doubt if this alters the scrumminess of these buns. I don't think I'll get to ice them today - my boys are grabbing them from the rack while they are still hot. I'll post the iced ones from Juno's Christening after the 2nd August. mmmmm. Can't wait to get home! can't wait to have u home, Mr Vegan!